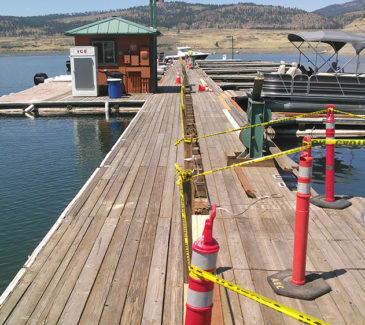 The Department of Interior’s National Park Service contracted AEC to repair the fuel and electrical systems of the fuel dock at Seven Bays Marina in Lake Roosevelt National Recreation Area. 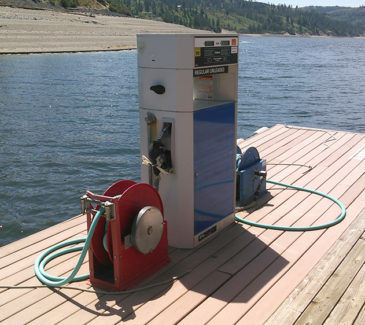 The Fuel System scope included the removal of existing fuel hose, reel, and galvanized steel pipe under the decking of I-dock to two existing dispensing pumps. AEC salvaged and transferred the hose reel and the motor for the NPS. 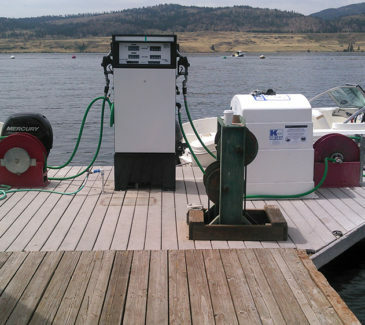 Next we removed the existing dispensers on I-dock and provided and installed new twin dispensers as outlined in the project specifications. We also removed 300’ of existing 2” galvanized piping from the dock and replaced with 300’ of flexible piping. 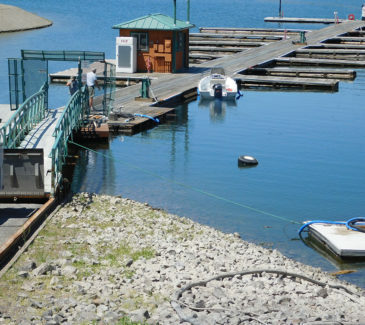 Then crews procured and installed 220 ft of flexible fuel hose from the shore to the dock, as well as installed the strain relief connectors. AEC also removed the shore-side fuel dispensing pump and fuel pipe, and salvaged them for NPS. The electrical scope included the procurement and installation of the audible alarm (TS-RA1) and remote acknowledgement switch (TS-RK) on the tank monitoring system. We managed the installation of the horn and switch to the outside of the building near the tank monitoring panel. The monitoring panel was reprogrammed to annunciate overfill conditions. AEC next provided and managed the installation of an auto-re-pressurization module and pressure relief valve. We covered all voids in the decking or deck replacement with untreated Douglas Fir. Additionally, crews upgraded the lighting on the dock from standard to LED lighting throughout the dock. AEC subcontracted a small portion of the project to Boyles Electric whom we work with frequently on fuel system-related projects.